All over America, parents and students are preparing for back to school to start. Are YOU ready? My kids start today!! It’s a bittersweet feeling for sure. I’m glad that I have all my shopping done for the most part. Now to get us on a schedule! Occasionally I have had to get my work done at public wifi spots during the summer while the kids play on the playlands at various fast-food places. I’m SO glad I have Freedome VPN to protect my iPad mini from getting hacked. 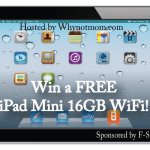 The good news is YOU can enter the giveaway today to win a 12 months subscription to F-Secure Freedome VPN an iPad Mini 16GB 3 WiFi AND an Apple® Watch Sport ! 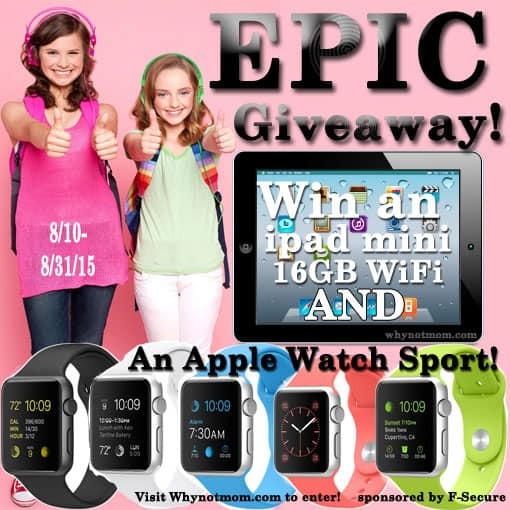 Imagine having an iPad mini protected by Freedome AND an Apple® Watch Sport just in time for back to school! If you want to try Freedome at no cost here is a three month trial code for you! Which color and size of watch would YOU choose? Come back and tweet daily for extra entries! I like that Freedome allows me to connect to any hotspot and have Wi-Fi Security. I like the Wi-Fi Security: Connect to any hotspot, public or private and surf carefree without exposing your traffic! I like the idea of surfing anonymously! My favorite feature is the Private & protected. Hackers can’t steal your stuff and annoying advertisers can’t track you. I love the fact you can use wi-Fi Security: Connect to any hotspot, public or private and surf without others know what your doing and what sites you are visitning! This is awesome!! Just an fyi,, some of your rafflecopter tabs are not working. I click and wont open so I can do them. Just wanted to give a heads up if anyone else was having issues. Thanks! Thank you for letting me know this Lavonne, I believe the links are all fixed now. If there are any you want to try again. How cool that they have a visual map of tracking attempts. That’s pretty handy. Security, plain and simple. I really don’t want every movement tracked by advertisers & cookies. I really like that I can connect to free wifi and surf the net without having to worry about someone hacking my information. Safety is my main focus. This is awesome! I’d love to win! I love that I could surf anonymously! I love the security and the peace of mind that it provides! I like that I am protected when on a public WiFi hotspot. Security is so very important. I love the idea of knowing that I’ll be free to surf without hackers or other people knowing what I’m doing. I LOVE the security and peace of mind of Private and Protected. The web has become a very scary place! I need protection Freedome offers! i love it because it’s so safe. I wouldn’t have to worry about hackers. 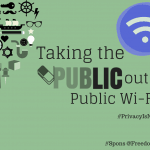 Knowing you can connect to free wifi and be secure. I love the security it provides so I don’t have to worry. i love the security with the tracking..thats awesome. The security and being safe from hackers which gives you a sense of peace of mind. The ability to keep anyone from tracking you and possibly steeling your info is a great feature and getting to be more and more important! I like that it blocks hackers and advertisers from obtaining and using your personal information. The privacy & security features would make my online business secure. It would provide some comfort knowing you are secured. I like the fact that it protects your privacy on all devices. I love knowing I can use my device anywhere via wifi and it is safe and secure! I like the security protection of anonymous internet searches. I love that protect my iPad mini from getting hacked. I like the very powerful security features that are included. my most loved feature about the apple watch is that it like a min phone especially when your on the go and can’t pick up the phone and you can always see who messages you. Allowing to connect Wifi and the freedom. The security and safety it provides! I love many things about it! The security, the protection and the ability to keep people from tracking you! It is a awesome feature. My favorite protection with F-Secure Freedome VPN is that no hackers can attack me when I’m at the local coffee shop surfing the web! I like the security. I rarely use public wifi because I know it can be risky. I like that you’re protected from hackers and advertisers. I like that you can connect to any hotspot including public ones and not be tracked. I really like the security features and the connectivity to Wi-Fi hotspots the most. I like worrying less about government surveillance, I don’t like the idea of them having some personality profile of me. I like the ability to SAFELY connect to hose public hotspots. This is a necessity, imo. I like that it’s private and protected! Security! With more and more of my financial transactions taking place online security it always something I care about. Love the security feature of complete privacy. I think the security feature is the best part. My favorite feature is the WiFi Security and you can connect to any public or private hotspot with no worries. The security of knowing I won’t be hacked while I’m taking care of business while I’m away from home hooked up to a wifi network that may not be secure. I really like the WiFi security. Always need protection when your on the phone or computer. I use a VPN to connect to work and I love how safe & secure it is! Connect to any hotspot, public or private and surf carefree without exposing your traffic! I like the privacy, security and anonymity. I like the security, privacy and anonymity. I would really like to win this just to see how it works.? I love that it gives you the protection against being hacked. Secure wifi is my fave feature! I like that you can remove geo blocking! It gives me comfort knowing I am less likely to get hacked. I have had all sorts of viruses and hackers on my older computers and phones, this would be awesome! I appreciate the wifi security – use any public or private hotspot and not share your information. Security is key. My favorite thing about the freedome VPN is that it’s private and untrackable. The privacy! how often we surf in public! I think the ability to use your computer while out and not get hacked is the best feature. I like the security it has. My favorite feature is the private setting, advertisers no way to track you. Sounds like a good security to have. This is a perfect gift for my girl, she’s preparing for school! My favorite thing about it is that it keeps my iPad secure. I loved all its features… I think security is the most needed feature and that is the reason I am crazy about it. Keep sharing such posts. I love that I’d be able to go online on the go without advertisers or anyone else being able to track where I go or what I type in. I love the wi-fi security anywhere you go. I love that it keeps things secure and you can be anonymous. My favorite part is that it is anonymous. I love the idea of free wifi. Its very nice to control the privacy on all devices. Also having that piece of mind. I love the feature of safe surfing. Not having to worry about apps/ads etc that my kids shouldn’t be seeing (or that I don’t want to see) is awesome. I love the security and ability of surfing anonymously! AAaaand seeing some sites I shouldn’t see is pretty cool too…. I like that I have protection on public WiFi when i’m out. It always creeps me out when I look up an item one day and the next there’s advertisement of that exact product following me around. The ability to remove geo-blocking. i love the fun colors of the bands and like that its so safe/secure. i love that you can control your online privacy and security with the push of a button. I love the privacy and protection! Hackers can’t steal my info! So important these days. Security is so important these days! Great giveaway. Favorite feature is that I don’t have to worry about giving up my privacy and being followed on the internet while surfing. My information is safe & secure. Love how I can surf anonymously.